Does the BlackBerry Bold 9730 exist? The Loch Ness Monster of devices? Unannounced - and unintentional - device leaks are nothing new in the tech world, though it's far less frequent phones that might not even exist get a turn in the spotlight. That's what seems to be the case with the BlackBerry Bold 9730, a phone that appeared unheralded on Research in Motion's App World Vendor Portal. The BlackBerry Bold 9730 was listed on site, though the reference was later taken down. The 9730 appeared alongside nine existing BlackBerry Bold devices, though no other info - specs, release date, etc. - was revealed on the site. As sources point out, it wouldn't be the first time a new BlackBerry device has been prematurely leaked. But based on a statement from RIM, it could be the BlackBerry Bold 9730 might not exist at all. Based on the rather conspicuous watermark on the above image, it seems the BlackBerry Bold 9730 leak was originally spotted by N4BB. But RIM reportedly got in touch with the BlackBerry news site to inform them that the 9730 listing "was simply an error on their part." It seems an intern at RIM headquarters in Ontario is due a stern talking-to. Meanwhile, the Canadian company has clarified to Engadget that the Bold 9730 leak is a "typo gone viral" - the listing was meant to be for the BlackBerry Curve 9370 all along. TechRadar has confirmed with Research in Motion that this is indeed the case. 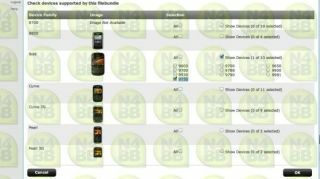 Hypothetically (since RIM's official position is apparently that the BlackBerry 9730 doesn't even exist), N4BB speculates that the leaked smartphone could be simply a CDMA version of the Bold 9790. If it does exist, the BlackBerry 9730 will be joining an elite line of BlackBerry devices. Both the BlackBerry Bold 9790 and BlackBerry Bold 9900 made it onto TechRadar's list of the top BlackBerry phones. And TechRadar also named the BlackBerry Bold 9900 the 15th best mobile phone in the world today.